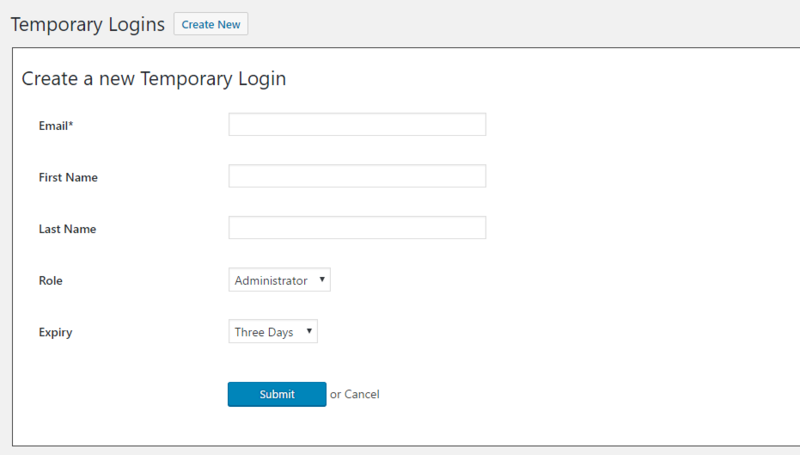 Sometimes its necessary to provide access to your WordPress back end to a 3rd party, in fact, I often request this when looking into specific issues whilst providing outstanding support to our customers, however you may not feel comfortable handing out your main admin logins so what options do you have? This post highlights a wonderful little free plugin which handles this for you, allowing you to create simple self-expiring logins with ease. Temporary Login Without Password is the main focus of today’s article – the plugin not only makes it a breeze to create additional users, but using it provides gives you the saftey net of disabling any new accounts after a certain period of time – perfect for when your handing out logins to a third-party. As you can see the plugin’s interface is very simple, which helps streamline its use of course. To create a fresh account simply supply an email address, name, role and expiry and your all set. The only thing to bare in mind here is the role, in most cases when your seeking support or allowing a developer access to debug an issue etc the Administrator role would be the most useful, however for a clear guide as to what each role means you can check this handy article. You can use following plugin for create a temporary user or disable user.